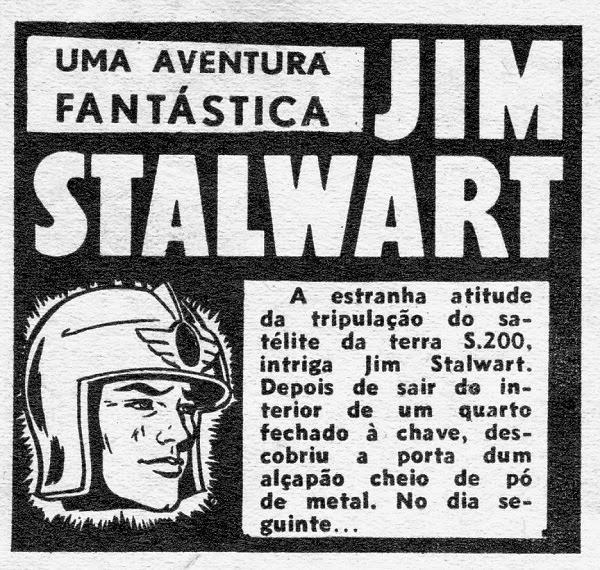 Surprisingly, for a little known British comic strip in a short run children’s newspaper, Space Captain Jim Stalwart was sold abroad and was printed in at least three other countries - Portugal, France and Spain. 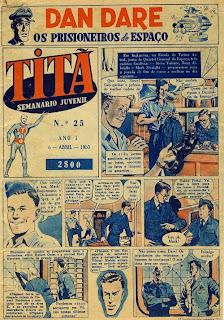 Jim Stalwart was published in Portugal in the weekly comic Titã which ran for 42 issues between 12 October 1954 and 10 August 1955. 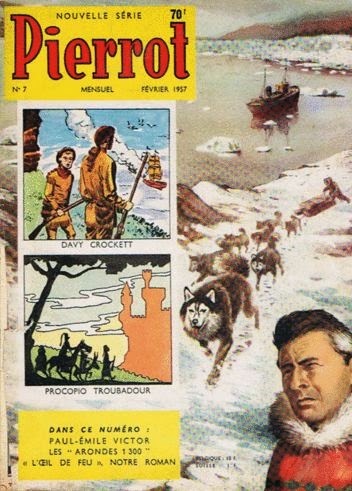 Edited by José da Costa Pessoa and published by P&B, Titã translated and reprinted many well known comic strips including Eagle's Dan Dare and Jeff Arnold, Tintin comic's Blake and Mortimer and the American newspaper strip Terry and the Pirates. 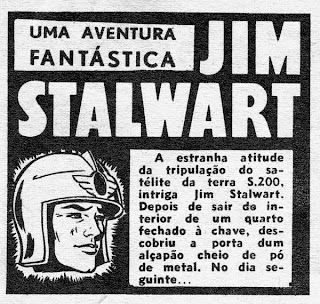 The comic only published the first Jim Stalwart story, The Fantastic Adventures Of The Missing S.200, which ran for 25 weeks from issue 7, 23 November 1954, to issue 31, 25 May 1955, under the title "O Satélite S 200". 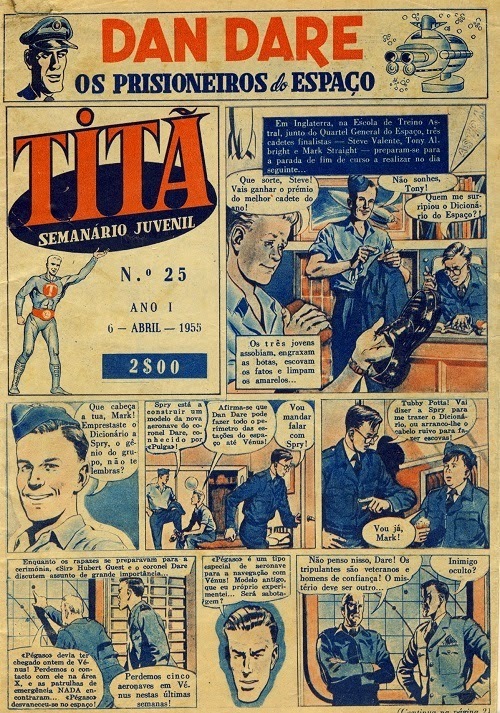 The British publication of the first story was still ongoing when Titã began publishing it at the same rate as the UK, one page per week, almost three months after their British publication. For Titã the landscape layout of the newspaper strip was changed to a portrait layout to better fit the more traditional shape of the comic. France began publication of the strip after the Junior Mirror had been cancelled in the UK. Jim Stalwart, Captain De L’Espace was published in the French monthly magazine Pierrot. Both Stalwart adventures that had been completed in the United Kingdom, The Fantastic Adventures Of The Missing S.200 and The Green Star, were published over six issues – numbers 5 to 10, December 1956 to May 1957, and the two stories were printed under close translations of their British titles, “La Disparition Du Satellite S-200” and “L’Etoile Verte”. This second run of Pierrot magazine, “Nouvelle Serie”, itself lasted only 17 issues from August 1956 to December 1957. Meanwhile, also in 1957, Stalwart was also published in the Spanish science fiction bi-monthly comic Futuro. 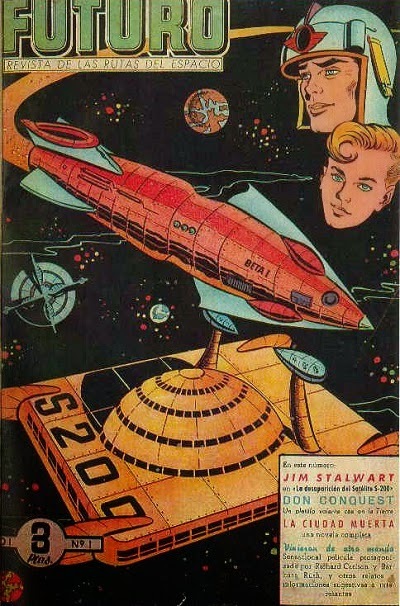 The first two issues of Futuro in 1957 ran colour covers featuring Stalwart with the first issue featuring the Beta 1 spaceship approaching the S-200 space station for their version of the story “La Desaparicion Del Satellite S-200”. Just came across this blog article Steve, and found it really interesting. As you are aware many British comic strips were reprinted overseas, mostly in the 1950's/60's and many from not only Eagle but Express Weekly such as Wolf the Britton. The only one's from DC Thomson I have ever seen is from Commando? 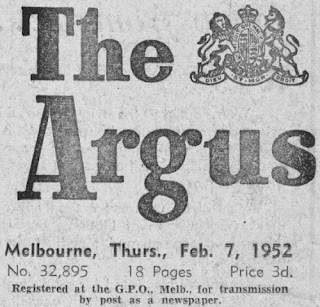 The tradition started in the early 20th century with Amalgamated Press selling schoolboy adventures to South America. And DC Thomson certainly sold many girls' stories abroad, in at least Holland, Germany and the Scandinavian countries. I don't think their boys' stories travelled quite so well.